Hard disk backup means making a precise, physical-level copy of some hard drive. All hard disk backup solutions must have a capability to make bootable disk images and virtual drives. Handy Backup allows such operations, as well as realizes any hard disk backup strategy including scheduling, encrypting etc. A good tool must be capable to make hard disk backup online, e.g. 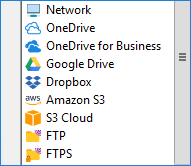 to some cloud such as S3 from Amazon or Google Drive. In other hand, the hard disk backup tool must also create local copies of a drive, for example, to make bootable drives or partitions from a USB external storage device. Hard drive backup software have a need for internal scheduling, to realize some hard disk backup strategy automatically. In addition, such tool must also provide “silent” hard drive backup services, to work under a batch file or just as a process in Windows, making no distractions for a user. 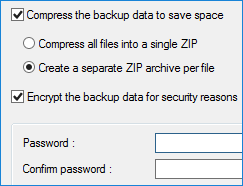 A hard drive backup tool works with potentially sensitive data, such as Windows settings, passwords, database content or commercial project files. Therefore, a good utility for hard disk backup must have a function for encrypting hard drive images, as well as for secured connection. Handy Backup meets all these requirements, and provides many other functions, tools and algorithms to make quick, safe and consistent hard disk backup! Try it just now by downloading a 30-day free trial version with all functions and plug-ins included! Start your tasks at a defined time, repeat by an interval from one minute to several months, or run a task when some event occurs, such as user logon to a system or plugging a USB drive related to a task into a PC. Use the built-in encryption tool to protect your hard disk backup from an unauthorized access, transfer your hard drive backup images to different secured cloud accounts or connect with an online storage by SFTP or FTPS protocols. 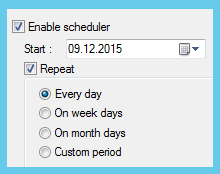 Start tasks in a Windows service mode, making no distractions for users. In addition, include Handy Backup into batch files, or, vice versa, start other command-line tools before and/or after your task. You can backup mapped drives, or use a network-oriented edition of Handy Backup as a centralized hard drive backup utility through a local network. Besides that, you have a lot of available online backup storages such as clouds and FTPs. Backup Software from Novosoft LLC. 89 USD per license. The Professional edition allows hard disk drive backup via both dedicated plug-ins just out of the box. In addition, it provides an access to a free copy of Handy Backup Disaster Recovery utility! Free 30-days trial version! How to Take Hard Drive Backup with Handy Backup? Handy Backup has two hard disk backup software plug-ins: “Disk Image” and “System Recovery” both located in the “Disk Clone” group of data sources. The first plug-in makes a consistent copy of a drive partition; the “System Recovery” plug-in writes a hard drive backup into a VHD virtual image. To make a task for hard disk backup, please follow the next instruction. Open Handy Backup and create a new task via the menu or using the Ctrl+N keys. 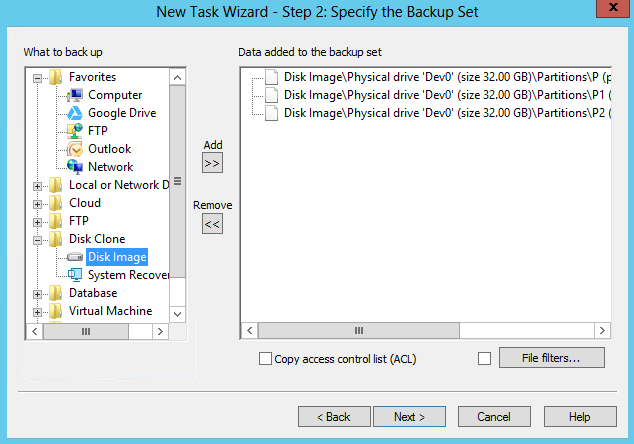 Select a backup task on the Step 1, and go to the Step 2. Open the “Disk Clone” group on the left panel. Select a plug-in you need. Now select a drive or a partition you will plan to back up. Click OK.
Continue creating a task as described in the User Manual. Note: To take a hard disk drive backup, you must run Handy Backup with an administrator privileges! Which Plug-in I Must Select for Hard Drive Backup? Disk Image: Select this plug-in when you are copying a data drive or a partition to restore it later with Handy Backup. A good option to save projects, databases, video and photo archives etc. System Recovery: Choose this plug-in when you are planning to restore the image of an entire hard disk with all partitions as a bootable drive, or use it as a virtual machine VHD drive. The Disaster Recovery (HBDR) utility is a third method for making hard disk backup. 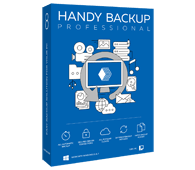 It is free to download and use for any buyer of Handy Backup Professional and Server editions (find an edition you need in the Comparison Table). The HBDR creates bootable and non-bootable hard disk image backups, and can restore it to a “bare metal” machine. For detailed information about the HBDR utility, please read the appropriate section of the User Manual and other articles.